Pike is a great place to stop when visiting the Public Market in Seattle. The beer is solid, but not outstanding. The seafood is so fresh and really is one of the best food serving breweries in the country, in my opinion. Usually busy but, not too mobbed. Pike is a northwest original and a worthwhile stop for beer tourists in Seattle. A few pints, steamed clams and you're fortified to walk out into the melancholy fog of Cobain country. I stopped in with some friends on an early Sunday afternoon. The location is great since it's right off the Public Market in Seattle, and we were looking for a place to watch the NY Giants game. The brewery wasn't nearly as crowded as I would have expected, since we were able to find a spot by a TV in a room that no one else was in. We got a few beers and appetizers. The beers were all good, and the Kilt Lifter Scotch Ale was particularly memorable - I'm thinking of trying to brew up my own version soon, since it isn't available in NY. The beers here are fantastic, with a mix of traditional UK beers like Kilt Lifter Scotch Ale and Old Bawdy Barleywine as well as newer hoppy IPA's and pale ales. Love the Bawdy, one of my favorites! I did not have a beer that I didn't like. The place is tight and crowded, with every inch of the walls and bar area covered in signage and brewerania, I could just wander around here for hours. There are also lots of cool glasses, books, and other barware for sale. The food is very good, including a mean halibut fish and chips that complements many of the house beers. A fun brewpub in a great location just blocks from the Pike Place Market. Had the 6 beer sampler which came with a sheet explaining what each beer was. All of the beers in the sampler were good, and the nachos were really good too (and happy hour meant 2-for-1 appetizers). The pub also has a cool beer memorabilia museum area with a lot of interesting pieces, as well as a decent selection of merchandise for sale. This is a Seattle destination for micro beer drinkers. We visited on a Tuesday afternoon and ordered some snacks and a sampler, 6 4-ounce beers for $8.95, a bit pricey as are the pints at $5.00 each. Iâ€™m not sure how many beers they had on tap, at least 10. We didnâ€™t get a choice in the beers included in the sampler, a definite drawback for those who like or dislike certain styles of beer. 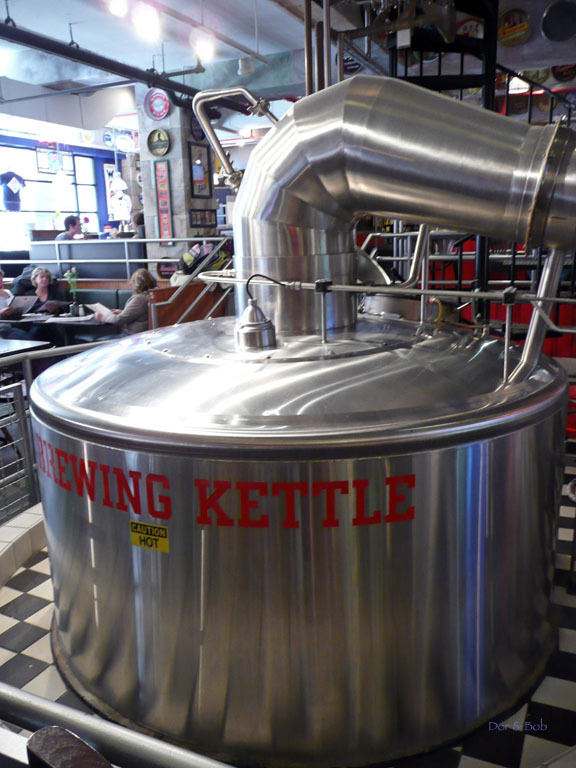 Part of their brewing equipment and the brewpub itself can be seen from the mall area above the brewpub. They have a very nice fold-out brochure with all the information about each of their beers; OG, ABV, hops, grains, history of each beer, etc. All the beers we sampled were great. 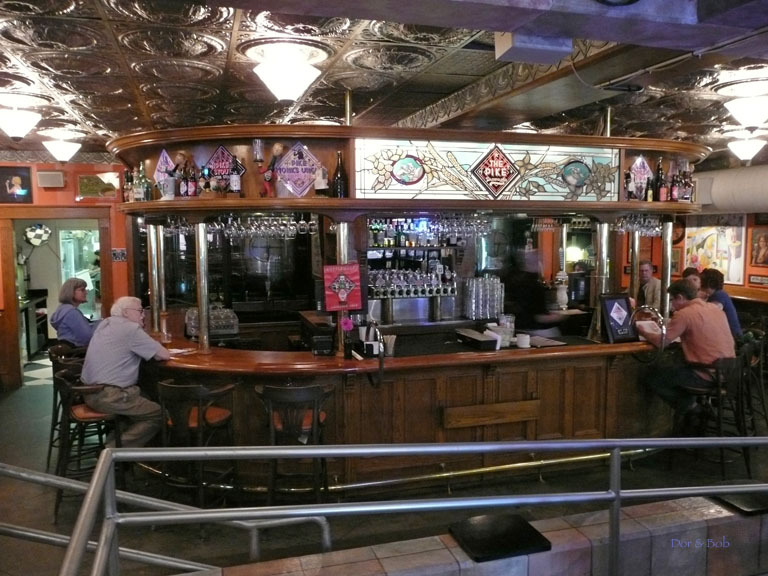 This multi-room brewpub is wonderful to explore with their superb displays of breweriana. We parked at an expensive garage several blocks away, there is limited street parking with meters. Everything is no smoking. Like Elysian, my feelings toward The Pike are conflicted. On one hand, they make quality beer, and have been longer than most other places in the region. But on the other hand, my personal tastes have never been overjoyed by anything I've had there. But whether or not they're my favorite brewery in the area, there's no denying that they are an important cornerstone in the Seattle craft beer scene, and make a lot of high quality, craft brew. As for the pub, I don't like it at all. It is definitely more of a tourist spot than a local watering hole. It's just not comfortable in any way shape or form. And the food is definitely below average when compared to other local brewpubs. So bottom line, any beer lover in the Northwest must try Pike beers at some point. It's a right of passage to really knowing our local beer culture. It may or may not become your new favorite, but either way, you have to appreciate what they do, and have done for the local beer scene. 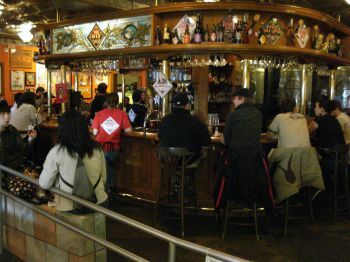 Pike Brewing is located just outside the Pike Market and is very much a tourist destination. It tends to be quite busy and the bar was tough to get a seat at. The overall atmosphere was excellent, a very nice collection of historical brewerania and historical brewing items. I also randomly talked to a number of other beer enthusiasts while inside, always a pleasant surprise. Overall, the beer was not spectatular, tried a number of beers on the menu including a number of guest taps. The Kilt Lifter was highly touted in Seattle, but it was a normal scottish ale in my estimation (not much different from McEwans). No beer particularly stood out. Did not try the food, but one other word about the service, requested to purchase a logo pint and they gave me two without charging. Quite a bonus. Pike Brewing has been around since 1989 and since 1996 in this location. The overall atmosphere is comfortable, fun, and a bit whimsical. There isnâ€™t really a neighborhood feel, but itâ€™s not stuffy or generic and definitely worth visiting. 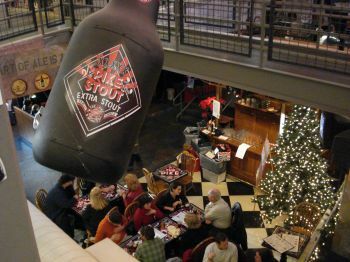 The top of the brewery, including the mash tun (30 bbl capacity), is visible from the indoor walkway above, which is part of the area of small stores related to Pike Place Market. To see the rest of the brewery, you have to go downstairs through the Pike Brewing main entrance and walk towards the back. The brewery itself is not glassed in, just separated by a barrier. The overall look is somewhat modern, somewhat art deco, and somewhat Victorian. The ceiling panels look like the classic western tin ceiling (originally made to look like plastered ceilings, you can still find these in some older Western towns) but are actually hung ceiling panels. The main bar is in a shallow horseshoe shape made with beautiful light, warm wood and brass accents and surrounded by tall chairs. Behind the bar you can see several 5.5 bbl Grundy holding tanks which are an unusual way to hold the most popular beers being served at the bar. The usual kegs are also inside this refrigerated area. Thereâ€™s also quite a bit of restaurant seating and a separate bar at the very back of the space. The decorations throughout are beer related (posters, trays, small bottles, etc.) - either from Pike Brewing or from the various Belgian and other European imports handled by Merchant du Vin (the importers owned by Charles Finkel, who started Pike Brewing and now owns it again). Thereâ€™s even a small â€œmuseumâ€ in the back bar area thatâ€™s worth taking a peek at if youâ€™re interested in historic beer memorabilia. Almost all of the beers are made here except for a few unusual imports. The beer is good, and as far as weâ€™re concerned, especially the IPA and the stout. They usually have some kind of American/Belgian style beer as well as more typical ales and thereâ€™s also one beer thatâ€™s cask conditioned. Minor note - youâ€™ll need to ask for the password code to get into the restrooms. I liked the Pike Pub. They had a great selection of beers. They where off on a few seasonals that night but it was due to a huge football game so a lot of people in town. The service could be better but that's just what you get for not training the people better. The Beer rocked the food was good. I will be back. Football nights are super busy and the closeness to Pikes Market makes this a great stop for all. Being in such a heavy tourist area (below Pike's Place Market), the Pike excels when you consider their typical market, as most of the tourist-oriented brewpubs I've been to in the past have been awful. But the Pike is really not awful, although I wouldn't consider great or really the best in the city (although Seattle has a lot of good brewpubs). On this trip, it was my second visit. I had visited a couple of years ago, running in randomly out of the rain from the water taxi, wet like a dog and without a sweater. I ended up having a few pints and catching a nasty flu. I was impressed mainly by their IPA. It was hoppy, full-bodied and, at the time, one of the best I'd had (although that's since changed). The atmosphere is comfortable and fairly nice. The bar seems to almost always be full, but there are bars on the side, but facing the brick walls. The bar is in the basement off from the crowded restaurant. There are decent views if you get a table, as it does face the Sound. This time, I had an IPA and a stout, both of which are very good there. The stout specifically has a nice texture, a very good taste and a good amount of carbonation, which is something I always freak out about. I also had a taste of the Double (which is, I guess, their dubbel). It bothered me because, when confronted with the description indicating "10% Wheat," I asked the bartender if it was very wheaty to which he insisted that it wasn't. I guess it's just a matter of different strokes for different folks because it tasted pretty wheaty to me. All in all, I think that you could do a little better at one of the Elysian places near Downtown, although certainly none of them are quite this convenient while in Seattle as a tourist. And it's certainly worth a try, at least once. While I'm not going to repeat the other reviews(read them for much detail on the beer offeings) I will say that the L=Kiltlifter Scotch Style Ale is one of the finest examples of that style that I have run across and is one of my favorites. The XXXXX Stout is also not for the weakneed. Being close to the Pike Place Market, if it's a weekend, or a Cruise Ship is in, it will be crowded, so plan accordingly. This was my first time trying out the beers and the brew pubs of the Pacific Northwest. Pike Pub is in a nice location many other things to do. The bar is very big. There are areas for lounging on a sofa and large table tops for dining or enjoying beer with friends. Pike Pub was a very clean place. Make sure you ask for the code to the restroom door before you get up. The salmon is probably the best thing on the menu and the fish and chips isn't to bad either. The service at the bar I would say is average. had not been here in a number of years, so during my latest trip to Seattle, I made a beeline to Pike. Located in one of the lower levels of the market, Pike has several elevations and this adds to both the ambiance and the look. 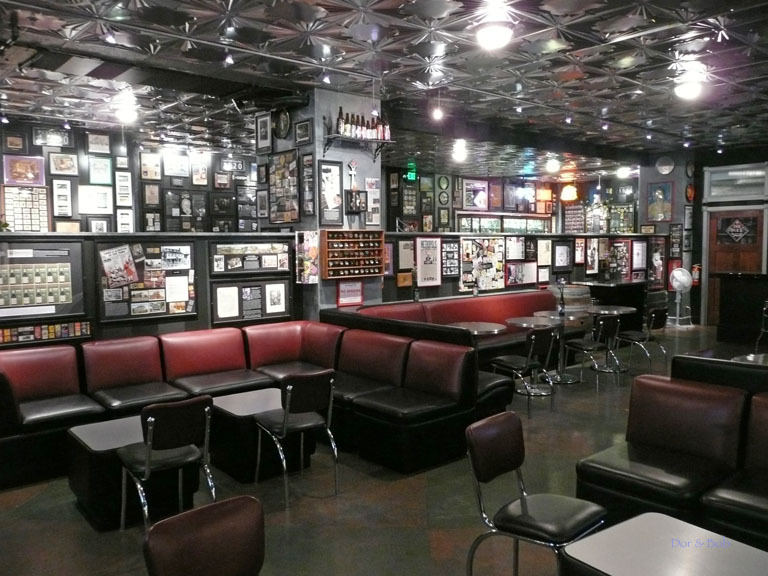 The U shaped center bar which seats about 20. They also have a small auxiliary bar and plenty of tables, you should have no problem grabbing some space. The Pike has lots of black iron, exposed ductwork and some neat display cases. The tanks are front and center. Lots of framed beer memorabilia on display. They offer 5 year round beers with additional seasonal and cask offerings. Brau Ayinger Weisse, Celebrator Double Bock and Framboise Lambic offered as guest taps. Guest bottles include Sam Smiths, Pinkus Organic Pils and Melbourne Brothers Wild appricot. In addition they have 8 botted Belgiums including Orval, Rochfort 6, 8, 10, Westmalle Dubbel and Tripel, Chimay Red And Chimay Grand Reserve. Not to shabby in my opinion. The server was friendly and quick. Not hovering. I enjoyed my food, my beers and the overall experience. Iâ€™m already looking forward to my return visit! A visit to Seattle must include a trip downtown to the Pike Place Market. Crowded on weekends and days, a tourist can choose to play a balalaika, see a display of magic, listen to a street-side piano player (on an upright he pulls from corner to corner), throw a fish, munch on chocolate, Russian pastry or a variety of delicacies, have a cup at the original Starbucks bring fresh-picked fruit and flowers back to the hotel room and, after all that, sit back with a good brew. 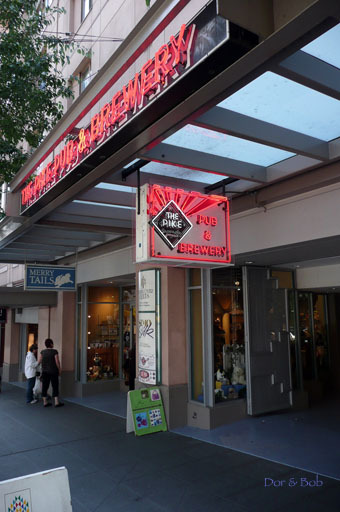 The Pike Street Brewpub sits on the lower level of the marketplace - and above the actual brewery which is underground. Charles & Rose Finkel started this landmark in 1989, the early days of the national microbrewery explosion. He was well prepared having founded Merchant du Vin, now the largest American importer of beer and served as the only agent west of the Mississippi River for Yuengling Brewery. In doing so, he discovered that most small breweries copied the "big boys" making beer with corn syrup, rice and other adjuncts rather than adhere to the Rheinheitsgebot law of barley, yeast, hops and water. He set out to change that. In 1997, he is presented with a Lifetime Achievement Award by beer guru Michael Jackson along with Anthony Fuller of Fuller Brewery in London...and Pike St. Pub is named the best local brewpub in America. In 2006, he is voted #1 among the Top 10 Beer Innovators. Don Russell in Draft Magazine wrote that one "cannot understate (his)impact. The exotic flavors of Merchant du Vin's imports influenced a whole generation of craft brewers. Take a look at the takeout selection at your favorite deli and you'll get an idea of how a wine merchant, of all people, changed the American beer scene." We here in the Pacific NW take great pride in pointing to the fact that we were the first to jump on this brew-wagon -- and we never let anyone forget it. True, we can be a bit obnoxious about it but, hey! Wouldn't you? And the Pike Street pub is one of the reasons. Their XXXXX Stout, Kilt Lifter Scotch Ale, Bootleg Brown (now called Tandem) and IPA have a "rap" sheet much to long to list here but filled with platinum, gold, silver and (in a very few cases) bronze. The IPA has been named the best in America prompting beer specialist Tom Schleis to write "make no mistake, this is a highly hopped beer but with a flavor that hits you that almost defies explanation." And there's also Naughty Nellie, named for the madam of the old LaSalle Hotel, Pike brewery's first home; Old Bawdy BarleyWine; Monk's Uncle Triple and assorted seasonals. There's enough food here to satisfy both the meat eater and vegetarian and of course, fresh seafood comes equipped with names like Penn Cove Mussels, Pacific Steamer Clams or Wild Salmon. On the down side, the music is always on and much too loud; a conversation is impossible since it's always crowded and the service can be spotty. Bartenders here seem to sport an attitude as evidenced during one trip wife Persimmon and I made to "the Pike." Saddling up to the bar, I was asked twice in 15 seconds or so, what I wanted. Having trouble deciding, I told him to give me a minute. Big mistake!! 10 minutes later, I was still waiting. As he passed by, I said "I guess I should have ordered earlier, huh?" He looked at me, nodded and disappeared. Fortunately, Pike's brews are readily available in most grocery stores throughout the Pacific NW but, a stop here is essential for any newcomer. Just make sure you know what you want before you belly up to the bar! If you've not tried Pike Place Brewery Beer, then you haven't lived. Located 2 blocks south of the Pike Place Market main entrance, this pub/brewery/restaurant puts the rest of the micro brew establishments to shame. Don't miss it if you visit our wonderful state! Try the "Naughty Nellie"...it is simply the best ale on the microbew market! The pub's own selections, as brewed on-premises, are assertive and distinctive. The extraordinary Opening Day Ale, highly bitter, and at 1060 OG, not for the squeamish, has faded into history. Regular beers include Pike Pale Ale, Golden Ale, IPA, and Kilt Lifter Scottish Ale. Guest beers are also poured, such as an ale from Elysian Brewing, imported Pilsner Urquell lager, and Ayinger's Celebrator Doppelbock. Seasonals and one-offs also join the list, and have included a smoked lager and spiced ale; others include the substantial XXXXX Stout, weighing in at 1072 OG, Pike Weisse wheat ale, Pike Porter, and Old Bawdy Barley Wine. Options also include cask-conditioned versions of some of the house ales. The pub has pared down its once-vast bottled-beer menu, but still features beers imported and marketed by Merchant du Vin; these include Samuel Smith Yorkshire ales, Ayinger Bavarian beers, Pinkus-Mueller Westphalian beers, Orval Trappist ale, and Lindemans lambics, among others, served in the appropriate glassware.